An island of great natural bounty. Heroes congregate here under a mighty sovereign. Groz Island is the location for chapters 84-85, 94-97, and 101 of the main quest. The main island of Idelva, the most powerful kingdom in Nalhegrande. 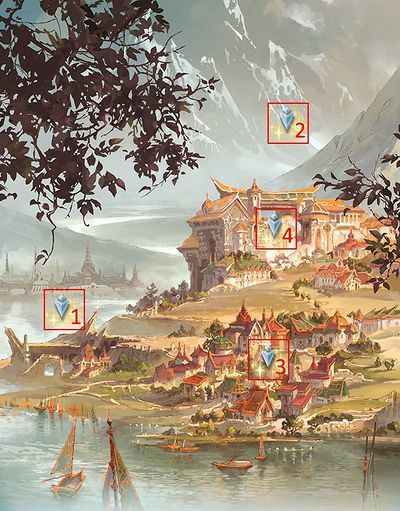 The prosperous lakeside capital of the kingdom, Luxurios, is one of the wealthiest cities in the skydom. Though the city continues to see rapid development, Idelva has decreed many areas off-limits to the populace to ensure balance with nature. The capital of the kingdom provides Idelva's economic support. Almost all exports from Groz Island find their way here before they're delivered to other islands in the territory. Although the city has always prospered from trade, it also enjoys a healthy fishing industry and many kinds of fresh seafood can be found in the city markets. This brilliant palace where the sovereign of Idelva resides looms solemnly along a waterfront. The natural scenery and harmonious ambience make it one of the most splendid spots in the kingdom. Placement of the main governing facilities on the outskirts is but an extension of the kingdom's logical nature. A lake in the capital city of Luxurios that has brought much fortune to the area. It's a vital asset of Idelva Kingdom as a channel for trade with other coastal cities. As the lake is a rich source of fish, fresh seafood is often used as the main ingredient in local dishes. This landmark rises high from the center of Groz Island. The foot of the mountain stretches out to the lower part of the island, but it's a symbol of both pride and peril to island residents. Many people have approached the mountain for years, but it's said that not a single person has ever reached its peak. The wealthy city at the core of Idelva Kingdom. At its center sits an enigmatic sovereign. Guaranteed 1 Raw Gemstone each time. A forest west of the capital. Those who venture here often find that these woods have a mean streak. 3 Lvl 75 Earth Gyre with 2.7m HP. A plain spreading along a lake shore. The reason of man has no place beyond here. An ancient primeval forest. The thick greenery reflects one's soul resting within. A sharp cliff that has silently witnessed the history of the skies. Within this dreary, untamed land, emotions trump reason and can be found in all living things. The spelling of Groz matches the German word "groß"( or "gross"), meaning "big", and the way it is supposedly pronounced sharper than in English. Volkshield Palace, the only exception, contains the word 'Volk', meaning 'people' (of a country). Lake Spiegel tranlates to 'Lake Mirror'. Boshaft Forest translates to 'Malicious Forest', though the adjective's correct declination would change the name to 'Boshafter Forest'. Veranderung Moor's correct spelling is 'Veränderung Moor'. As that translates to 'change moor', the grammatically correct name is 'Veränderungsmoor', 'Moor of Change'. Abend Cliff translates to 'Evening Cliff'. Stille Wilderness translates to 'Quiet Wilderness'. The German word is 'Wildnis'. This page was last modified on 5 April 2019, at 00:04.